since it's Erev Rosh HaShana, and there are so many posts I wanted to write, emails to send, good wishes to convey, and yet, I found myself without enough time to do so. - posted about the opportunity to help save a life. - studied over shabbat with son #2 for his gemara test. On the other hand, I didn't get to post about milluim, didn't post what I wanted to about Rosh HaShana, didn't post about Nefesh b"Befesh, didn't do a Treppenwitz-type post where he links to many friends of his, which is really a great idea (and I would do it if I had the time...) -- Treppenwitz even calls from time to time, "just to say hi" -- which is truly heart-warming that blog people call sometimes just to say hi. And therefore, there's something I needed to say. This past year was rather amazing for me on a personal level -- as I managed to meet many of you in person (whether at the JBlogger convention, or in the US, or simply around Israel). Without a doubt, there's something to be learned from everyone, their take on life, their contribution to society, whatever it is that makes them unqiue -- and I appreciate meeting each and everyone one of you. And with that comes responsibility. Not so much the pressure to post quality, informative, and entertaining content -- but that people are actually reading what goes up here. Blogs can ruin lives and have all sorts of negative consequences -- and I hope that this blog still manages to convey something positive. Some people think that the virtual blogosphere means ignoring "reality" -- and I sincerely apologize if reality took second seat to the virtualness of the blog world. Additionally, I would like to apologize if you sent me an email to which I didn't reply, to those who sent me links to publish and I didn't, to those I should have linked to...but didn't, and to those commenters who I should have acknowledged with followup comments -- but didn't. It was never malice -- just lack of time...or even a bit of laziness on my part, for which I'm sorry. Not any less important -- is that I'm sorry to those who were upset or offended by anything I may have written (what comes to mind is my posting about shabbat guests). As we welcome the new year, may we all be inscribed in the books of health, well-being, repentance...and the book redemption. Redemption on a personal level and a national one. May this be a year of increased Jewish unity instead of divisiveness, and may the JBlogosphere bring about positive change. PS: Obligatory Srugim comment: I spoke to Laizy Shapiro for a minute today, and his message to you all is that he appreciates your comments and insights about the Srugim show (they put alot of thought into he writing of it, and many of your comments are spot on.). He also added, "its only a TV show". Thanks to everyones help & generousity, we managed to raise the full ammount to cover the costs of Gili's surgery. Gili flew this morning to London, where she is supposed to undergo surgery on this comming Tuesday (first day rosh hashana). It is now live. You can check it out here. Register to Vote - NOW!!! Ive received the following so many times in the past few days, both from local friends and neighbors...and now even from bloggers in the US, so I decided to post it and do what I can to help out. While I don't know the family personally, I do know for a fact that this baby has this condition, and the people behind the campaign are serious and respected individuals. Six weeks ago, Gili Rossler was born with a rare defect, which causes severe tracheal constriction -- and only one lung. The combination of these two conditions is extremely dangerous and causes a constant deterioration in her ability to breathe and to the supply of oxygen to her body. A surgical procedure has been recently developed for the treatment of this condition. One in London (where three procedures were performed with a 70% success rate) and one in Chicago (ten procedures with an 80% success rate). Under the instructions of the treating physician Dr. Tommy M. Schonfeld, Director of Pediatric ICU, Schneider Children's Medical Center of Israel, the procedure must be performed urgently! The cost of this procedure, including the necessary ambulatory flight comes to about $600,000. Please send cash or checks (even postdated) to “Save Gili”, or wire-transfers to Mizrachi Bank, Account No. 176373, Branch No. 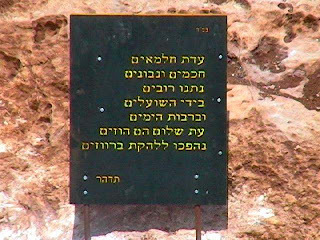 483 (Karne Shomron). Israeli donors please advise if you wish “Section 46” invoices for tax deduction purposes. Tizku L'Mitzvot -- please pass this on. 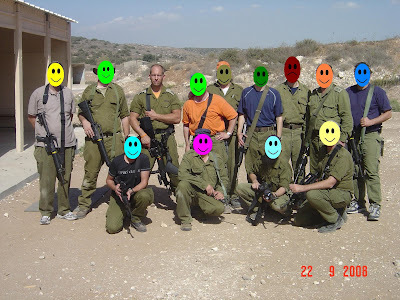 Rafi G, host of the notable LifeInIsrael blog uncovered another gem for us. The newly opened Jerusalem "Calatravva" Bridge seems to be cursed with problems. Despite the immense pricetag for planning, architecture, building and planned maintenance (close to 10 millions dollars annually for maintenance alone), Rafi notes that the latest issue is that women are complaining that partially transparent areas of the bridge allow for people below to look up and see beneath the clothes of those walking above. Of course, the bridge has already been been sprayed with grafitti more than once -- so it can now also look like every other building and landmark in Jerusalem. I found this video very thought provoking. Its not preachy -- and its refreshingly apolitical. Give yourself 6 minutes to watch it today before Rosh HaShana. After reading Rafi's post which references a burgeoning child molestation scandal in RBS (yes, those are my usual ranting comments down below), I have to ask the studio audience here: If a few students (or even one student) accused a teacher of molestation and the school was refusing to remove him/her from his/her duties pending an investigation, how would you, as a parent, react? Call it coincidence, or is that just Jewish Geography? Yes, after yesterday's terror attack at Kikar Tzahal, everyone was asking, "who is connected to who?" Well, of course the terrorist came from the same neighborhood as the previous Jerusalem terrorists: Jabel Mukhaber. And the IDF officer that killed him? Lt. Elad Amar who killed the terrorist is a graduate of the Pirchei Aaron Yeshiva High School in Haifa, and his former commander in the Paratrooper unit where he served before moving over to artillery was none other than... David Shapira - the hero of Mercaz Harav. 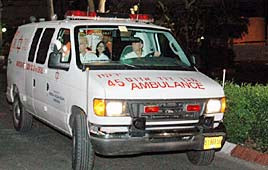 David Shapira was a passer-by who, along with Yitzhak Dadon, shot the terrorist in the Merkaz HaRav massacre in Jerusalem on the night of March 6. Moshe Plesser, the passer-by who shot the first bulldozer terrorist in Jerusalem on July 2, is David Shapira's brother-in-law. Yakki Asa-el, the passer-by who shot the second bulldozer terrorist in Jerusalem on July 22, was Moshe Plesser's yeshiva high school teacher. And today, we find out that Elad Amar, who shot the terrorist in the attack last night, served in the Paratrooper unit commanded by David Shapira. I'm not going to attempt to present an explanation of this incredible triple confluence. I will simply note the obvious: That the likelihood of it being random has got to be infintessimally miniscule. Will update this as information becomes available. Terrorist attack in Kikar Tzahal in Jerusalem. 15-20 17 Wounded. Two seriously. Arab terrorist drives through crowd of people. Many Most of the injured are soldiers that were touring the Old City before Slichot. Terrorist killed by first shot by armed civilian on Shivtei Yisrael Street, and then killed by soldiers an IDF Officer from the unit, and (perhaps) police. IDF Soldier may lose his eye after a Palestinian terrorist threw acid at him today. The terrorist passed through the Shchem (Nablus) checkpoint humanitarian lane (which is meant for those in need of immediate medical attention, and bypasses the normal line) bypassing the normal security check. Upon reaching the soldier, she threw the acid at him and fled back to where she came from. Haveil Havalim #183, the weekly carnival of The Jewish/Israeli Blogosphere is now live. You're invited to come take a look at what we have been speaking about the past week. Despite the bans, despite the prohibition of owning a TV in the first place, all sorts of people are watching the Srugim TV show. I’m coming out of hiding and admitting that I have been watching the show “Srugim”. While I’m not necessarily comfortable with everything shown on that show, I do believe it brings up a number of powerful serious issues in the religious community in Israel. Not surprisingly, his posting about the previous Srugim episode is very similar to what I had planned on writing, including creating the short video segment, as well as using the exact same video clip of the jam-packed shul in Neve Dekalim, hours before the Disengagement eviction. Dan discusses the issue that "no is also an answer" -- when discussing the theological issue of why G-d didn't answer the prayers, that Israel does not evict and destroy the communities of Gush Katif and the Shomron. I thought the issue was well done, and found the acting of Hodaya's teenage cousin,"Shvut" to be a realistic and accurate portrayal of teenage angst, irresponsibility, rebellion and searching. While Shvut rails against G-d for abandoning the "good people" and for ignoring their prayer, Hodaya chastises her, "there are worse things than the Disengagement"..."No is also an answer [from G-d]". Shvut runs off that night, and Hodaya worries incessantly about her. When Shvut returns and Hodaya screams at her for going off to party, and Shvut locks herself in the bathroom, Shvut quiety reveals that she was at the Kotel...praying. What Dan does not touch upon is that while Hodaya may have scolded Shvut, Shvut is still passionately enraged at G-d -- she still believes. Hodaya's "no is also an answer" lecture comes from cynicism as she no longer cares enough -- or believes enough -- to be angry at G-d.
Popular sites are chock full of discussions about the show, despite it being the about "srugim". (Note: Srugim is definitely IMHO, referring to the crocheted kippot of the national religious crowd, not being interwoven into society or anything to do with bars on Jerusalem windows). Lastly, I absolutely despise the Nitzan character. Here she is, playing the scared female to enable Nati to show his masculine bravado and kill a roach (jook). Personally, I would have stomped on it...even barefoot. The exit polls predict that Tzippi Livni is the new leader of Kadima! It's becoming almost routine for Israel's pollsters and media pundits to get it wrong time after time. True, Tzippy Livni did win, but by 341 votes. The margin of error for a win by 341 votes makes it statistically impossible to have accurately predicted that Livni would win -- based on scientific statistical models. One should tip their hat to the "Yisrael Hayom" (Israel Today) newspaper whose headline this morning read: "Ma'avak Tzamud" (or "neck and neck") and refused to print outright that Livni won. At one point last night during the count, Mofaz was even leading Livni by 40 votes. So what happened? How does it happen that time after time, Israel's pollsters and media get it wrong? How did every single polling company predict that Livni would win by a double digit landslide, yet in reality she won by 1 percent? The red-faced pollsters (and Israel's media pundits, like IDF radio host Razi Barkai) placed the blame this morning not upon themselves, but due to "the lying, conneiving Israeli." Instead of looking at the pollsters for answers, one should be turning to sociologists and societal psychologists...or ask the pollsters why they skew results? Everyone laughed at Shaul Mofaz when he made his "bombastic" announcement a few days ago, that he would win the primaries with a result of 43.7% of the vote -- after all, Haaretz 's poll predicted a landslide victory for Livni. Of everyone who made predictions, Shaul Mofaz was the closest to reality! While he did lose -- Livni received 43% and himself 42%, he was closer than any other polster or pundit. Mofaz knew his people were showing up to vote, which is why he was so certain of his win. What is he secret -- perhaps he really should be the leader of Kadima? Why would an Israeli "lie" to a pollster? Perhaps because people enjoy getting egg on the face of the arrogant media outlets that try to run our lives on a daily basis. I am disappointed that you have chosen not to respond to my query below, regarding the Jerusalem Post's censorship of Edwin Bennatan's blog article. Today, I found a new notice* posted on this same blog, which surprisingly acknowledged that "the Jerusalem Post found nothing improper in Mr. Bennatan's article itself". In spite of this, the notice says, the article "was removed from this site last week in resolution of a legal dispute concerning 'talkback' comments posted in response to his article". If there were indeed defamatory or libelous talkback comments, then I can certainly understand why the Post would remove them. I can even understand why the Post might pay Mr. Freedman damages for libel. But what legitimate explanation can there possibly be for removing the article itself, which, according to Post's own statement, contained "nothing improper"? It is painfully clear what happened here: Mr. Freedman obviously threatened legal action, and blackmailed the Post. Removal of the offending talkbacks along with an apology was not enough for him, and neither was an offer of a cash payment. No, Freedman wanted more, didn't he? He wanted the Post to censor an article that contained embarrassing criticism of his political opinions. And the Post cravenly complied. The Post's capitulation to extortion raises serious questions about your paper's commitment to fundamental journalistic ethics: If a little-known two-bit extremist blogger is somehow capable of forcing the Post to completely censor an opinion piece that politely criticizes his opinions, then who is to say that powerful political figures cannot – and do not – force the Post to do the same thing, or worse? What reason is there to assume that the Post is not refraining from publication of criticism, or embarrassing information, regarding individuals far more important and powerful than Seth Freedman – people who might blackmail the Post into hiding things they don’t want the public to see, just as Freedman has? If you have a legitimate explanation for your paper’s behavior in this matter, I’d certainly be interesting in hearing it. In a related matter, I ask you once again: To which "charity", exactly, has the Jerusalem Post contributed money at Mr. Freedman's behest? Want to let the Post know what you think, too? Send an e-mail to David Horovitz and/or their blog administrator. UPDATE: This morning, the notice was at the top of this page. But apparently, the Post had second thoughts, and removed the notice a few hours later. However, they seem to have forgotten to remove it from this other page containing the same blog article. I changed the link above to use the page that still contains the notice. And I've saved a copy, of course, in case the Post removes the notice from the second page as well. Can you shoot better than this girl? Srugim's last episode to air on Rosh HaShana?! Several Srugim aficionados have already contacted me about this alleged travesty -- how can Srugim's final season one episode be aired on Rosh HaShana night (Monday evening, Sept 29th)?! This reminds me of life in Israel during the 1970s. Eons ago, before cable TV in Israel, before Satellite TV, before Channel 2, before commercials, when there was only one TV channel for Israeli viewers (excluding Jordan and Lebanon TV channels) -- a new TV show was due to air..."Eishet Chayil", a woman of valor. The problem was that it was to air on Friday afternoons, either just before Shabbat was about to start or after Shabbat started already. If I recall correctly, the Ulta-Orthodox Aguda party spearheaded the effort against the Israel Broadcasting Authority to have the show moved to earlier on Friday. After all, a show entitled "Eishet Chayil" should be viewable to all, especially the religious TV-watching community without worrying about desecrating the Shabbat. As a result of Aguda's pressure, the IBA heeded their request and changed the viewing hour to earlier on Friday afternoon. Imagine how shocked people were, when they found out that the show "Eishet Chayil"...the show which Aguda had gone head-to-head with the IBA over moving it's Friday broadcast to an earlier time...was the translated name for..."Wonder Woman!" Have no fear dear readers -- I just got off the phone with the show's director, Laizy Shapiro, and he said YES had moved the viewing date for the season finale of Srugim to the following week, Monday evening of October 6th. As as an aside, I'm in contact with Maaleh about the full version of Eicha...will keep you posted. I was rudely awakened by my pager's buzzing, as an incoming message from the IDF spelled out that a terror attack just took place not from from us in the settlement of Yitzhar. A Palestinian terrorist infiltrated the Shalhevet Yam neighborhood of Yitzhar, set fire to a building, and stabbed a nine year old boy. The terrorist fled and was not apprehended. Security should be tightened in the surrounding areas. Additional details came in ... the terrorist tried burning down a second home as well, and the 9 year old discovered the attack and started yelling for help. It was then the terrorist stabbed him 5 times in the back until the knife broke....he then threw him off the balcony of a caravan -- a 12 foot drop. What we all found out on Saturday night was that the terror attack against the 9 year old was a minor detail -- the big story was the settler reprisal against the village that hosted the terrorist. The IDF's inaction of not chasing after the terrorist infuriated the residents of Yitzhar -- this terror attack came on the heels of their fields routinely burnt down by Palestinians. Yes, the settlers reacted, took the law into their own hand and went into the village. Were their actions a beacon of democracy and good will towards their Palestinian neighbors? Nope. Should the IDF have done their job? Yes. Should the police have done their job? Yes. No one did their job except for the Palestinian terrorist. The stabbing attack and torching of an empty home in the settlement marked the "climax of the abuse perpetrated by Arab residents of the nearby village," Yitzhar Spokesman Yigal Amitai told Ynet. He also slammed the IDF conduct earlier in the day, referring to the army's failure to identify or capture the terrorist behind the attack. "It's clear to everyone that this incident could have ended disastrously," Amitai said. "A whole family would have been butchered and burned. Yitzhar residents said that in recent months Arabs set seven fires in the settlement's wheat fields. "To our regret, in all those incidents no real deterrent activity was conducted by the military and army," Amitai said. The settlement spokesman also slammed the reactions issued by leftist Knesset members and groups during the Shabbat. The media pogrom against the settlers was swift and brutal, everyone conveniently refusing to condemn or acknowledge the severity of the terror attack that triggered yesterday's events. It's much more serious and grave to Ehud Olmert that the Yitzhar residents should be upset at the torching of 2 buildings, upset at the IDF's inaction against terrorists, upset at the terror attack against a 9 year old -- and then they overturn a car and charge through the village which harbors terrorists....all that is much more grave and serious than the terrorist attack against a nine year old. Yet let's take a step back. Can you imagine what the Arabs would do when there's an attack against them by a Jew? I'm sure they are the epitome of calm, and coldly calculated reasoned action. And if they would lose their cool, they would be soundly criticized by Ehud Olmert and the MKs of the left...? Let's examine an actual case study from 2005. Situation; Four people were killed and at least six others were wounded after army deserter Eden Natan Zada opened fire aboard a bus in the Arab town of Shfaram, in northern Israel. Eyewitnesses said angry locals, or possibly bus passengers, managed to storm the bus following the attack and killed the shooter. Police reportedly had trouble retrieving the body, which was lying on the stairs of the bus, as a result of the angry Arab mob gathered at the scene. What happened to the blood thirsty Palestinian terrorist this past Shabbat that tried killed a 9 year old? Did anyone dare call him a vile, blood thirsty terrorist? At the scene in Shfaram, a lynch mob disarmed the Jewish terrorist, and then rioted, taking the law into their own hands, and killed Eden Zada. In response to the possibility of charges being brought against those who took the law into their own hands MK Barakeh said, "We will take action to break any hand that is raised against us." Balad chairman, MK Jamal Zahalka slammed the Haifa prosecution's decision to subpoena the Shfaram residents in the case: "This is an act of provocation. The police failed to find out who was assisting Zada and who sent him, and are blaming the victims. If they indict they will have riots on their hands"
Any comments from MK Tibi about the 2 legged animals in Shfaram? Any comment from MK Zehava Gal-on the impossibility of a situation whereby the police is doing nothing while this is going on -- or has he time has come to end the policy of inaction vis-à-vis the Arabs?" I don't recall Peace Now Secretary General Yariv Oppenheim saying the "The arabs do not miss any opportunity to hurt Jews and endanger human life"
And of course, Olmert was uncharacteristically silent then too. It seems that its settler season again. 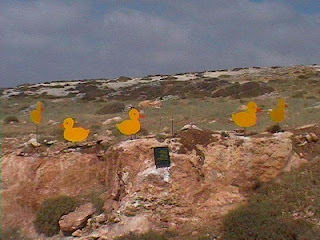 I was reminded of the painful artistic expression on road 60 near Beit-El, 10 years ago after many terror attacks on the roads. gave guns to the foxes. turned [us] to a flock of ducks. The Jerusalemite has an interesting interview with Srugim's director, Laizy Shapiro. 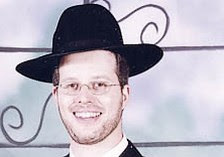 Laizy Shapira, 32, spent his childhood in Philadelphia, where his father served as a shaliachof the Jewish Agency. After moving back to Karnei Shomron, he served in a Hesder programfor yeshiva studies combined with IDF service. Shapira graduated from Jerusalem's Ma'ale School of Television, Film and the Arts, the only communications production program in the country targeted towards observant Jews, when he was in his late 20s. Professional doors began to open for Shapira in the years that followed, largely thanks to acclaim he received for two of his student projects, Eicha and Saving Private Finklestein,but he soon found himself struggling, with day jobs cleaning houses and giving tours at theKotel Tunnels and at the Davidson Archeological Park. But an association with producerYonatan Aroch eventually landed Shapira a deal to co-create, co-write (with long-time collaborator Chava Divon) and direct Srugim (literally, "knitted"), a surprise hit for Yes TV. The show, which focuses on the lives of five central 30-something religious Jerusalemite bachelor and bachelorettes in a manner that is refreshing and clever, has taken Israeli pop culture by storm. 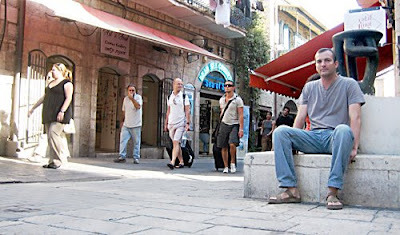 When not attending screenings of episodes at the Jerusalem Cinematheque, Shapira is working on plans to hopefully export a translated version of the show to North America and to possibly air Season One on Israel's Channel 2 this winter – all while developing ideas for Season Two, which should air by the end of 2009. Batya has done an outstanding job. You can follow the carnival here or here. 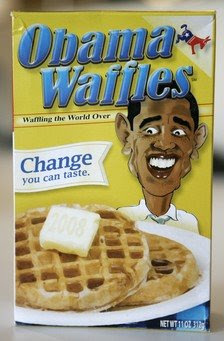 The Muqata Management would like it to be known that we do not carry Obama Waffles. While it is true that Obama waffles (quite a lot in fact) and has in the past tried to pander to the Muqata audience, we found parts of the packaging to be inappropriate and the actual contents of unknown origin and quality, which most definitely shift during transport (all the time in fact). So while it is a brisk seller at US-based Republican conventions, Obama Waffles will not be available in any Muqata outlets. The entire article has disappeared, and has been replaced with this apology. I understand from the apology that there were some user comments to the article that were deemed “defamatory, threatening, and inappropriate”, and I can certainly understand why the Post would delete such a comment. But why was the article itself taken down? Did it contain something that you find to be “defamatory, threatening, and inappropriate”? If so, then what was it, exactly? And if it did not contain anything “defamatory, threatening, and inappropriate”, then why has it been deleted and replaced with an apology? I would point out that the Post's censorship of this article has already become a subject of discussion in the blogosphere. (See here for an example.) This action calls into question the Post's journalistic standards, and its commitment to freedom of speech. Mr. Horowitz: In the past, I have admired you for your defense of Israel against egregious media bias against Israel. The article by Bennatan was very similar to many such defenses that you yourself have presented in the past. His article was well-written, reasoned, and free of any ad hominem attacks or anything even remotely inappropriate. I am shocked that the newspaper under your editorship has chosen to censor it. I would not have expected this from you. I (along with many others) am interested in an explanation of why the Post has done this. P.S. : I am also quite curious to know which charity Mr. Freedman has selected for the Jerusalem Post to make a contribution to. If you are also disturbed by the Post's censorship of this article, why not tell them? Here is David Horovitz's e-mail address. Did the JPost capitulate to legal threats? Being that one of the mitzvot in this weeks parsha is about divorce, I happened to see a few divrei torah related to the subject of divorce and agunot. Below is a dvar torah from Rabbi Avi Weiss of the Hebrew Institute of Riverdale that I think gives a short history as to why we have the problem of agunot nowadays. This ties in very nicely with Jameel's post the other day. This week's portion touches upon the controversial issue of spouses who refuse to grant a Jewish divorce (get). The Torah states "and he [the husband] shall write her a bill of divorce and place it in her hands" (Deuteronomy 24:1). In other words, the giving of a get is the husband's exclusive domain. While it is difficult to pinpoint why the Torah so decreed, it could be suggested that since women in biblical times found it difficult and even impossible to fend for themselves socio-economically, they would never desire a get. Yet, as pointed out to me by Rabbi Shlomo Riskin, the pendulum swung as time went on. The unilateral right of the husband to divorce his wife was limited by the advent of the ketubah (marital contract) which details the many obligations that a husband has to his wife, including an amount of money that his wife would receive in case of divorce. In this way, a husband's absolute power to divorce his wife was severely restricted through this financial obligation. The unilateral power of the husband to give the get totally disappeared one thousand years ago when Rabbenu Gershom declared that a get could not be given without the wife's consent. If the ketubah made it difficult for a husband to unilaterally divorce his wife, Rabbenu Gershom obviated that unilateral power in its entirety. The get became a bilateral process rather than a unilateral one. With time, the get process entered yet a different stage, a stage in which women could initiate a get. In the middle ages, for example, central communities in Europe were governed by the Va'ad Arba Aratzot, the committee of the four major Jewish population centers. Jews there had their own political sovereignty and judicial autonomy. If the bet din found a wife's claim reason for divorce, it was powerful enough to order the husband to give the get. As long as the bet din was strong enough, the agunah matter was resolved. The situation here in the United States is different. Because of the principle of separation of Church and State, the bet din has no legal power to implement its decisions. This has created a situation where a husband could blackmail his wife by demanding exorbitant sums of money or custody of their child(ren) before giving his wife a get, even when the bet din believes the get should be issued. While America has seen an unprecedented amount of Jewish life and activity, it has not reached the level of the Va'ad Arba Aratzot. Both the leadership and the people are at fault. The population refuses to submit to the will of the Bet Din, and the Bet Din has not worked hard enough to earn the respect its constituents. Until this vicious circle is broken, the agunah problem, a problem that has been successfully addressed in the past, will remain one of the most painful issues we face today. © 2008 Hebrew Institute of Riverdale & CJC-AMCHA. Rabbi Avi Weiss is Founder and Dean of Yeshivat Chovevei Torah, the Open Orthodox Rabbinical School, and Senior Rabbi of the Hebrew Institute of Riverdale. 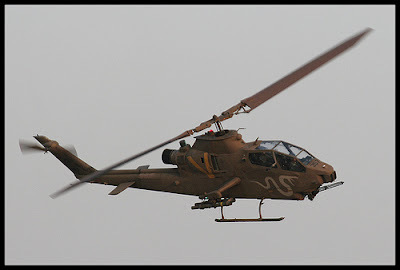 An Israel Air-force Cobra helicopter crashed last night around 6:30 PM in Northern Israel as a result of the tail rotor flying off the helicopter. It was rather distressing hearing all the MDA volunteers responding trying to locate the pilots -- as ammunition exploded all over the places making it impossible to approach the crashed helicopter. Two pilots died in the crash -- one of them was identified as Major (res.) Shai Danor, 35, a father of five from Rosh Ha'ayin. The other pilot's name has not been released for publication at the request of his family. All IAF Cobras have been grounded till an investigation reveals why the rotor flew off. Two years ago I dedicated my 9-11 post to the memory of Nancy Morgenstern, one of the victims. Go see it, it's worth reading. In a poll for the University of Maryland, people were asked who they thought was behind the attack. On average, only 46% believe that Al-Qaida was behind the attack. 15% believe the US was behind it. 7% believe that Israel masterminded it. One in four doesn't have any idea who was behind it. 43 percent of Egyptians say Israel was responsible. The poll, managed by the Program on International Policy Attitudes at the University of Maryland, of surveyed 16,063 people July 15 to Aug. 31. It has a margin of error of plus or minus 3-4 percent. On IDF radio this morning, a professor from Tel Aviv University was asked about Islamic Fundamentalism and 9/11, and out of the blue, he started comparing "Noar HaGvaot" (hilltop youth) with Islamic fundamentalists. To his credit, the reporter was slightly incredulous that the interview had just made such a bizzare turn, and he said, "Noar HaGvaot have never done anything like this, how can you make such a comparison?!" The TAU professor replied, "they are very similar in their mindset, and I worry that 9-11 done by Al-Alqaida was only the beginning and that Jewish extremists like Noar HaGvaot will do the next [mega attack.]" The hatred from Israeli's left knows no bounds -- and using 9-11 as a springboard to bash "Noar HaGvaot" and Israel's right wing is particularly offensive. A Muqata wordle. Very fun toy. Lurker, feel free to analyze and offer any deep insights. Olmert to Olim: America is here?! IKEA in Israel - 30% higher prices?